May Theilgaard was born in Chicago, Illinois to a family of Danish immigrants. Her father was a landscape designer, and she studied botany and ecology at the University of Chicago, where she graduated Phi Beta Kappa in 1918. She also attended the School of the Art Institute of Chicago. She taught in the Chicago public schools before marrying Raymond Watts. In 1940, she went to work as a staff naturalist at the Morton Arboretum in Lisle, Illinois, a position she held for 20 years. She wrote scholarly articles and wrote and illustrated popular tree and flower identification guides still in use today. Her 1957 book Reading the Landscape was used by educators for decades. She wrote a similar volume called Reading the Landscape of Europe. She wrote "Nature Afoot," a regular column for the Chicago Tribune, and hosted an educational program on public television. She also led efforts to establish the Illinois Prairie Path, one of the first successful abandoned rail-to-trail conversions in the USA. The May T. Watts Nature Park in Highland Park, Illinois, and the May Watts Elementary School in Naperville, Illinois, are named after her. 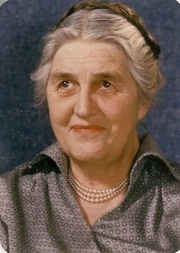 May Theilgaard Watts is currently considered a "single author." If one or more works are by a distinct, homonymous authors, go ahead and split the author. May Theilgaard Watts is composed of 11 names. You can examine and separate out names.